JF Chen. It sounds like the name of a mysterious character in a film noir thriller. And, coincidentally, forty years ago, when Joel Chen opened his first shop on West Hollywood’s Melrose Avenue, it was close to the RKO studios which, throughout the 1940s and into the 1950s, was a virtual noir factory churning out a stream of stylish, classic crime dramas including: The Stranger on the Third Floor (1940), Journey into Fear (1942), The Spiral Staircase (1946), They Live by Night (1949), The Prowler (1951) and While the City Sleeps (1956). Chen’s business is based on stylish classics of another kind from roughly the same period: mid-20th-century design and objects d’art. But from the start, it relied on the stealthy and dogged detective work often portrayed in noir films. 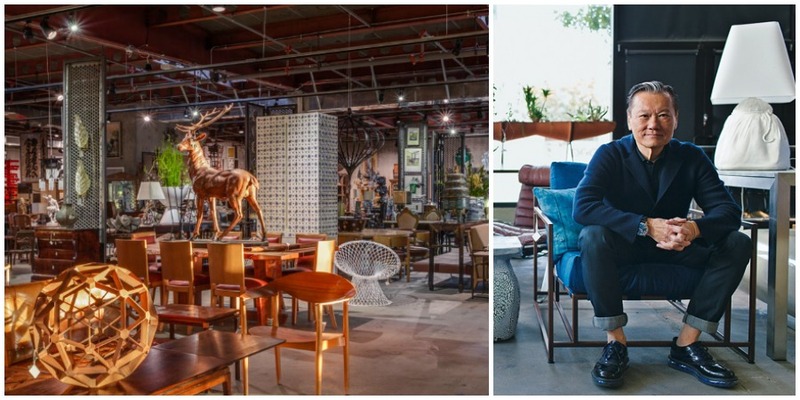 Renowned for his taste and expertise, nowadays he has a vast 30,000+ square feet (3,000 square metres) of shops and gallery space, all still located within the same area of Los Angeles. An important resource for Hollywood film-makers, Chen’s inventory includes furniture and design objects ranging from the curious to the exquisitely beautiful. While he offers work by well-known international design giants, like Poul Kjaerholm, Jean Prouve, Charles and Ray Eames and Hans Wegner, and, in 2006, JF Chen was a major lender to the first-ever retrospective of Ettore Sottsass’s work in America, he has also become interested in discovering and cultivating emerging artists, such as New York-based Karin Haas (b 1986), and designers, several of whom he now represents. So much of Chen’s ingenuity and knowledge is invested in sourcing each item from every corner of the globe that the aficionados and A-listers, who frequent his shops and seek out his services, might expect to pay finder’s fees in the form of premium prices. However, in Christie’s forthcoming JF Chen Collection Online sale, the most expensive item listed is a pair of rare Luigi Caccia Dominioni (1913 > 2016) Italia 22 wall lights from 1957, estimated to sell at between $5,000 and $8,000. Meanwhile, the rare beast at the top of this post, along with a number of other items, some with identified makers, some without, but all endorsed by Chen’s trusted dependability are a steal at only $800 to $1,200. Elsewhere, an FK 82 lounge chair designed in 1968 by Danish designers Jørgen Kastholm & Preben Fabricius (1931 > 2007 /1931 >1984) is expected to sell for between $2,500 and $3,500. Some of the objects he collects, he says, speak to Chen more than others and if they don’t sell he takes them home with him. His personal bête noire is guests offering to buy items in his house, however, for this grave misdemeanour, the price they pay is no more menacing than his vehement refusal to sell.